Currently, we cannot use specific keywords as targeting mechanisms in Shopping campaigns (other than those keywords you use in your Titles and Descriptions), but that doesn’t mean you still can’t harness the power of keywords to improve the performance of your Shopping campaigns. The power of negative keywords, that is. Use the Search terms report available to you in the Google AdWords interface to run a report which will show you which search terms were actually used by an end user to trigger your Shopping Ads to show in the search results. The Search terms report for Google AdWords is found under Keywords>>Search Terms when you are within a Shopping campaign. Once you pick the desired time-frame you want to view, you can simply put a check-mark into the selection boxes of those keywords you want to add as negative keywords, then add them as either Campaign negatives or Ad Group negatives. By culling through these keywords, you will be able to exclude those keywords that don’t convert , or exclude those keywords that are simply not a good fit for the products your client is trying to sell, and thus avoid wasting your PPC spend on non-productive traffic. For Bing, you will need to navigate to the Dimensions tab and look under the Search Term column to see the actual search terms being used that trigger for Bing Shopping ads to show in the search results. You can export this data, filter through the data to find the appropriate negative keywords, and then copy and paste the desired negative keywords into the appropriate Bing Shopping campaign. 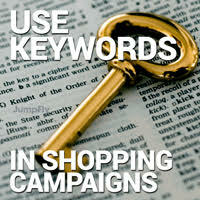 So don’t forget to use the negative power of keywords in your Google Shopping and Bing Shopping campaigns. It’s astounding what some simple changes in the title line of your products in your Google Merchant Center feed can do for your Google Shopping campaigns in Google AdWords. Google gives serious weight to the first five to ten words in the title line for products when their system decides which keyword search phrases will trigger your Google Shopping Ads to show in Google’s search results. By taking the most important core keywords that directly relate to what the product is that you are selling and moving those keywords towards the front end of the title, you can often make dramatic improvements in the performance of your Google Shopping campaigns. After all, the first objective is just to get your Google Shopping Ads to show up in the search results. 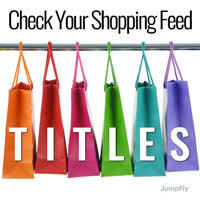 You need the Shopping Ads to show before a potential customer can click on them. Sorry if I might be belaboring the obvious here, but sometimes you have to go back to the absolute core fundamentals and start with the most basic steps. Without a solid foundation, you will have nothing to build on. It’s worth the time and effort to do a review of those title lines. We have seen improvements happen in real-life scenarios when optimizing title lines in this manner. By re-writing one title line on one product, we have seen that one product go from getting about one or two sales a day in Google Shopping to getting 15 to 20 sales a day on the same product. And it was all due to simply optimizing and re-writing the title of the product, and putting important keywords front-loaded at the beginning of the title. JumpFly can work with you to discuss what improvements you can make to your product titles. JumpFly also offers Product Feed Management to their clients as another service, taking the raw feed data and optimizing it for Google Merchant Center, as well as Bing and other Comparison Shopping Engines. 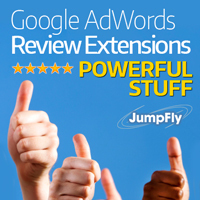 Use Google AdWords Review Extensions to give new potential customers an extra level of comfort doing business with your company. 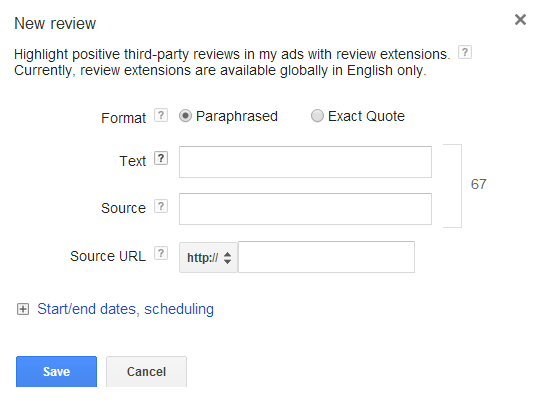 To implement AdWords Review Extensions, navigate to the Ad Extensions tab then select View: Review Extensions in the drop-down box. Create your new Review Extension by supplying the appropriate review text, the source of the review and a link where users can verify the review as being genuine. The Review must come from a reputable third-party source, so you cannot just throw up your Aunt Sally’s stellar quote from her personal blog. For more detailed information on using Review Extensions, visit here to read more about Google’s advertising policy regarding the usage of review extensions. For further assistance, you can always contact a qualified PPC management company. Do use accurate and current reviews. Do use a quote or paraphrase that represents a current source. Do link to a page where the content of the review should be apparent and easily visible on the source page. Do use ellipses if you cannot fit the entire review and need to truncate a portion of it, to show missing words or phrases. Do link to the original source, not your website. Do not link to press releases or a second-hand report. Do not link to aggregate ranking or user-review websites. Do not use links to individual’s reviews. Great reviews are incredibly powerful. If you’ve got ’em, flaunt ’em!